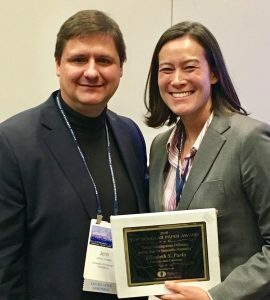 John H. Prellwitz, Communication Ethics Division 2018 Chair (left), presents Elizabeth Parks (right) with the Top Faculty Paper award. 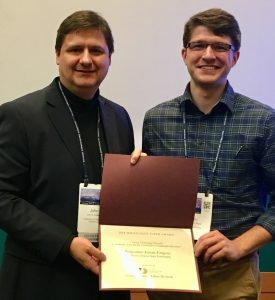 John H. Prellwitz, Communication Ethics Division 2018 Chair (left), presents Benjamin Firgens (right) with the Top Student Paper award. 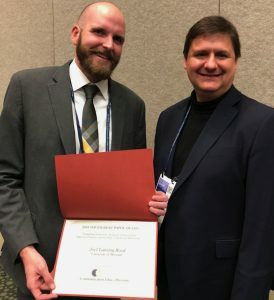 John H. Prellwitz, Communication Ethics Division 2018 Chair (right), presents Joel Reed (left) with the Top Student Paper award. 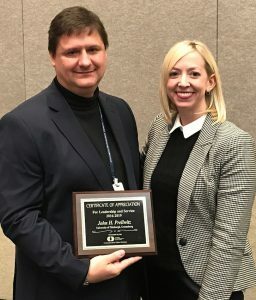 Amanda G. McKendree, Immediate Past Chair of the Communication Ethics Division (right), presents John H. Prellwitz, Communication Ethics Division 2018 Chair (left), with a Certification of Appreciation for Leadership and Service from 2016-2019. Please view the latest issue of Ethica (below). Please view the attached job call (below) for the position of Assistant Professor of Conflict, Mediation, and Negotiation at California State University, Long Beach. As a reminder, today at 11:59 p.m. EST is the last day to sign up for NCA’s annual convention at the early bird rate. We look forward to seeing everyone at the conference! Hello everyone! Please follow the link below to the recent issue of Media Ethics. The Nomination Committee is still seeking at least four more candidates for At-Large Legislative Assembly, three more candidates for Committee on Committees and two for second VP. Please contact Amanda McKendree (amckendree@nd.edu), Communication Ethics Nominating Committee Representative, with any suggestions for NCA members who you think would be interested in leadership positions with the association. Additional information is available at: https://www.natcom.org/calendar/2018-nominating-committee-call. Please note that we’re still accepting nominations beyond the May 1 deadline that is listed on the website. Please click here to view the 2018 National Communication Association Convention Communication Ethics Division Call for Awards. The submission deadline is September 1, 2018. Hello everyone! Please remember that the submission deadline for the 2018 NCA Conference is Wednesday, March 29th at 11:59 PST–good luck in finalizing your submissions!